Larry C. Kilgore, MD, has been named Chair of the Department of Obstetrics and Gynecology at the UT Graduate School of Medicine. Kilgore joined the UTGSM faculty in 2009 and is currently professor and director of Gynecologic Oncology. He served as interim chair of the Department prior to being named Chair. Dr. Kilgore's expertise in gynecologic oncology is nationally recognized. He began his career at the University of Alabama Birmingham (UAB) Hospital, following residency and a Gynecologic Oncology Fellowship at UAB School of Medicine. During his 20-year tenure as faculty at UAB, Dr. Kilgore served as professor and held the J. Max Austin Endowed Chair in the Division of Gynecologic Oncology. He also was a senior scientist for the UAB Comprehensive Cancer Center, fellowship director for Gynecologic Oncology, and residency program director in the Department of Obstetrics and Gynecology. Dr. Kilgore also participated on numerous national committees and task forces and served as a board examiner for the American Board of Obstetrics and Gynecology, a role he has continued. His research on women's cancers has focused on safer and improved treatments for ovarian and cervical cancer, and several of his studies have been supported by grants from the National Cancer Institute totaling more than $7 million. Dr. Kilgore's research has been published more than 100 times and presented nationally at numerous meetings. Dr. Kilgore has served the editorial board of Gynecologic Oncology, an international journal, and also has served as an editorial reviewer on several journals including Cancer – Journal of the American Cancer Society, The American Journal of Medicine, the Journal of Reproductive Medicine, American Journal of Obstetrics and Gynecology, and Journal of Surgical Oncology. Dr. Kilgore's commitment to education and leadership extends beyond residency training. He is an inaugural member on our Academy of Scholars. He also completed the inaugural Physician Leadership Academy, a year-long education program provided by the Executive Education Program of the UT College of Business Administration. 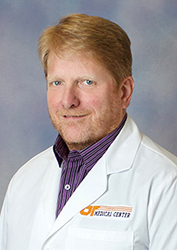 As chair, Dr. Kilgore plans to promote resident and medical student education, focus on faculty development, enhance clinical research in women's healthcare, and advance safety and quality health outcomes for the women of East Tennessee and The University of Tennessee Medical Center. In 2009, Dr. John Bell, Director of the UT Cancer Institute, recruited Dr. Kilgore to be the leading physician in gynecologic oncology services, specifically to fill a need in minimally invasive and robotics procedures. Dr. Kilgore has established a presence in the community for his commitment to healing, and Dean Neutens said he will undoubtedly also leave a mark in education and discovery as chair of the Department of Obstetrics and Gynecology. 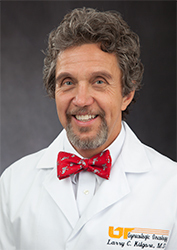 Bruce Ramshaw, MD, FACS, has been named Chair of the Department of Surgery at the UT Graduate School of Medicine. Recognized internationally for laparoscopic and advanced hernia procedures, Dr. Ramshaw also specializes in creating patient-centered care teams. Dr. Ramshaw's appointment began October 1. Dr. Ramshaw has also held appointments at Emory University School of Medicine as assistant professor of Surgery and director of the Hernia Institute. He is a board member and past-president of the Americas Hernia Society and member of the Society of American Gastrointestinal Endoscopic Surgeons (SAGES) Communications Committee and SAGES Hernia Task Force. He has been an abstract reviewer for the Society of Laparoendoscopic Surgeons meetings, and he was a charter member of the Atlanta Surgical Association. Dr. Ramshaw has also been a board member of the ABC's Telemedicine and Telehealth advisory board as well as board member and co-founder of Intellitrain, Inc, which specializes in the delivery of customized technology training with an emphasis on the theories of adult education.